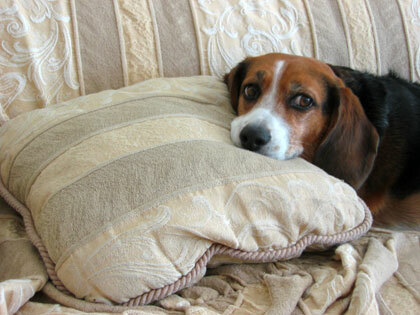 Bagel is a male tri-colored beagle who was born on March 17,1996. Bagel came into my life in July, 1996 when my younger sister brought him home from a pet store. I found out later that he was the last puppy in his litter to be adopted, a factor that accounts for his insecurities and his intense dislike of cages. Who can resist this face, evidenced by the above photo? Bagel is a typical beagle. For one thing, he likes to sniff everything. He goes where his nose takes him. For that very reason, I do not allow him to go off-leash unless he is in an enclosed place. He loves to patrol the backyard to see who or what has been in his yard. When I am in the backyard and call Bagel, he does not answer; he is out sniffing. When I come home, Bagel smells me to see where I have been. Bagel is a people-oriented person. He likes being being part of a group. He does not like being part of the background. When members of the family or any guests come over, he gets very excited, barks, and squeals. He loves getting attention. He hates being left home alone, especially at night. Bagel loves to bark. When anybody passes by or comes near the front door, he barks. When there is a dog on television or there is some noise, he barks. Bagel is a notorious chow hound. He loves food, food, food. When I eat, he sits right near me or puts his head on one of my legs with the hope that I would drop a tidbit his way. We are very careful not to have food close to edge of the island nor on the coffee table because this chowboy could sink his teeth into the food. One time, I left open a bag of dog cookies which was sitting on top of a container of kibble in the pantry, and I discovered that the nutball got into the cookies and spilled them out. When it comes to food, he does not know when to say when. In fact, he will do anything for food. Bagel likes going out on walks. When I bring my backpack out and take the leash out, he gets excited and jumps on me. Check out the photo galleries of Bagel, Boo Boo and Jasmine. I will have a directory of local businesses that deal with pet care.